It has been a tough week in Texas. Hurricane Harvey forever left its mark on this state. Out of this tragedy, it has been heartwarming to see the response of people helping people. Would this have happened this way in any other state? I would like to think, yes, but I am not so sure. Perhaps because the weeks prior to Harvey were so filled with hate, this country needed something more out of humanity. Did you know the name Harvey means “battle worthy?” Harvey came with the power of a mighty army and the people responded in return. Is there something bigger in this battle? I have been encouraged by the mention of God in the media (at least the media I watch and read). Yesterday during Vice President Pence’s stop in Texas, a woman led a prayer during the press conference. This doesn’t happen during every news conference…although in a lot of cases, it should. 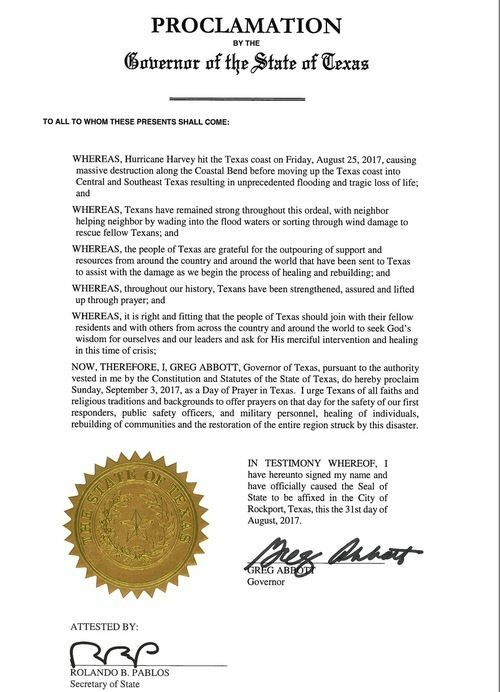 Governor Abbott signed a proclamation during this same news conference declaring Sunday, September 3, 2017, as a “Day of Prayer in Texas.” Sounds good, right? Yes, until you read the proclamation. The governor had already stepped out and decided to make this proclamation, but it is so jumbled. In one sentence, he said we should “seek God’s wisdom,” but in the next, he is vague about to whom we should pray because he welcomes the prayers of all faiths and religious traditions. Not all faiths pray to God. Ugh, when will we learn? How important is the wording in a proclamation? Very. I immediately thought of the king of Nineveh. Remember when Jonah finally made it to Nineveh and delivered that fateful message, “Forty days from now Nineveh will be destroyed” (Jonah 3:4)? The people believed this prophet wandering around the city shouting to the crowds. They believed that the message was from God, and they responded by fasting and repentance. This was not a man of God issuing this proclamation; this was an evil man. Clearly, he understood his life and the lives of all 120,000 people living in Nineveh at the time were in danger. Yet, he recognized it was only God to whom they could pray. He didn’t instruct the people to call upon their idols or pray in the way they felt led. No, he called upon God, and God responded. The people were spared. In the conversation between Jonah and God, God said to Jonah, “But Nineveh has more than 120,000 people living in spiritual darkness, not to mention all the animals. Shouldn’t I feel sorry for such a great city?” (Jonah 4:11) God’s disposition always includes the possibility of mercy, but He has conditions. The first condition is to love God above all else. The king of Nineveh recognized the position of God above all else when he stepped down from his throne. Jesus spoke about the people of Nineveh to the Pharisees. In Matthew 12:41 Jesus said, “The people of Nineveh will stand up against this generation on judgment day and condemn it, for they repented of their sins at the preaching of Jonah.” He said a similar thing about the queen of Sheba. After making these statements, Jesus spoke of evil spirits. Jesus said that an evil spirit flees into the desert, but finds no rest so it returns to inhabit the person again. Not only does it return, but the evil spirit finds some friends to come along with it, and cause even greater damage. Jesus said, “That will be the experience of this evil generation” (Matthew 12:45). What was Jesus referring to exactly? The rejection of the Messiah. A rejection of the Messiah is a rejection of God and His ways. Can we continue to walk around in spiritual darkness without contemplating the weight of it all? Are we really okay with instructing people to pray to whomever and whatever? Are we sure we want to be the generation who leads people further and further into spiritual darkness? It is only God who can tell the wind and the waves which way to go. It is only God, through Jesus, who gives life. Jesus said, “Anyone with ears to hear should listen and understand” (Matthew 13:9). If the king of Nineveh listened and understood God’s power, will we? I don’t want to be a part of a lost and undone generation. I know God’s mercy is great, and He will respond if we seek Him. We must seek Him. We have people dying by the minute, we have catastrophes worldwide, and more storms and wars are on the horizon. 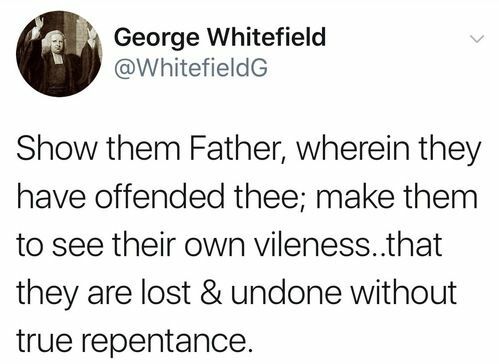 Repent and pray to God alone today and now. I found your blog through your comment on Anne Graham Lotz post today, and I have to speak to your comment. As a resident of the state of Kentucky, I live in the "Bible Belt". I was born into a Christian family, and reborn at age 26 with a long life of living in Christ behind me, but I have to disagree with your comment for several different reasons. 1. It's very late in the life of this nation to be sowing more seeds of division especially among fellow believers. I'm so tempted to say that this Christian nation gave up the fight years ago, but I'm not willing to give up hope, yet. 2. This is the time for CHRISTIANS to work and pray together. We can't expect Moslems, Jews, Himdus, or any other religion to pray in the name of Jesus. Praise His name, CHRISTIANS pray in His name, but we do not have to believe the same things or see things the same. God above is the One who hears us, but I believe He expects us to love and encourage each other. 3. As I see it, He has placed Anne Graham Lotz in place for these days for that very purpose. That's not to say she never makes a mistake, but how about just praying for her without public disagreement?. I couldn't keep from thinking your comment might have been an ad for your blog, but it's not my place to judge you, either, .4. I am so very grateful God's name is being glorified in these terrible times. I'm also grateful we have a President and other government officials who openly encourage prayer and openly study their Bibles. I believe we need to commend them when they show Christian devotion, but as believers, they also know they have no control over the hearts of all the people of this nation, Openly criticizing them in any part of their Christian leadership just gives satan more ammunition. 5. Since long before the 2016 election, I have made numerous posts on my FB page on the necessity of this country putting their differences aside and be willing to work together for the good of all. I have often stated the urgency of Christians being willing to work and pray together despite their differences. God sees our hearts. That's where the problems lie, but that's also where the answers are. I constantly remind my FB friends of the importance of remembering 2 Chron. 7:14, and I try to remember it also.